University of Notre Dame History Professor Thomas F.X. 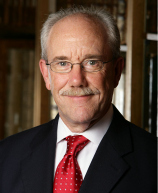 Noble has been chosen as president-elect of the American Society of Church History (ASCH) for 2013 and will become its president the following year. Founded in 1888, the scholarly organization encourages the study of the history of Christianity and its relationship to surrounding cultures in all periods, locations, and contexts. “It is a considerable honor,” Noble says of his selection, which coincided with the end of his 2012 term as president of the American Catholic Historical Association (ACHA), a national society of scholars, archivists, and teachers of Catholic studies. “It was a delightful surprise, coming right off being president of the ACHA,” he says. Noble will be the sixth person to serve as president of both the ASCH and ACHA—and the first to ever serve as president of both organizations in successive years. The ASCH supports its mission through conferences, grants, awards, and publication of a journal called Church History: Studies in Christianity and Culture, for which Noble is a member of the editorial board. As ASCH president-elect, his main responsibility is to lead the program committee for the winter 2014 conference. Noble says he has two primary goals in mind for when he takes over as president in January 2014. “First, we’re interested in exploring and expanding the scholarly side of our enterprise from an international point of view and engaging more international scholars in our society at our annual meeting,” he says. At Notre Dame, Noble has served as chair of the Department of History and director of the Medieval Institute. His teaching and research interests include Carolingian history, medieval Rome, the popes, the papacy, papal relations with Byzantium, and controversies over religious art. Recent books include From Roman Provinces to Medieval Kingdoms; Charlemagne and Louis the Pious: Lives by Einhard, Notker, Ermoldus, Thegan, and the Astronomer; and Images, Iconoclasm, and the Carolingians, which was named winner of the Otto Gründler Book Prize in medieval studies for 2011. That same year, Noble also won the Sheedy Excellence in Teaching Award—the highest teaching honor in the College of Arts and Letters—as well as a National Endowment for the Humanities fellowship for his current book project, Rome in the Medieval Imagination. Originally published by Jonathan Warren at al.nd.edu on February 22, 2013.